If you are concerned about the possibility of your web images being downloaded and reused unlawfully then have a look at imagerights.com They are offering a new service for photographers where you can upload images which are then monitored on the internet 24/7 for any publication on the net. Costs are about $55 per year for up to 250 images. I've uploaded about 70 images so i'll let you know how it goes. 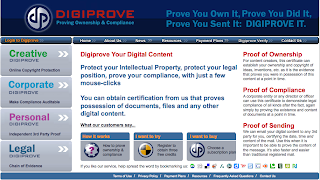 Also on the subject of protecting copyright, a company in Ireland called digiprove.com also offer a protection system where you can digitally encode an image and register the image with a date and time, rather like posting documents to yourself and lodging in a safe deposit box unopened.